A national campaign to raise awareness of a system to help people alert police when in imminent danger but unable to speak is being launched today. Kerry Power believed that if she made a silent 999 call she would not need to speak or make a noise for police to get vital assistance. Sadly her call in her moment of dire need was terminated, and her ex-partner David Wilder called police later that morning to report he had fatally strangled her. The system is well-established in the UK but is only effective if the public know and understand how it works. It could, in extreme situations, potentially save a life. The system filters out thousands of accidental or hoax silent 999 calls made daily. Around 50 emergency calls from mobiles a day are transferred by a BT operator to police forces in the UK as a result of someone having pressed 55 when prompted, enabling the police to carry out urgent enquiries to respond. It is not true that police will automatically attend if you make a silent 999 call. Callers need to listen and respond to questions and instructions, including by coughing or tapping the handset if possible, or if using a mobile phone, once prompted by the automated Silent Solution system, pressing 55. The ‘Make Yourself Heard’ campaign is being launched by the Independent Office for Police Conduct during National Stalking Awareness Week (April 8 to 12), with support from the family of murder victim Kerry Power, Women’s Aid and Welsh Women’s Aid, and the National Police Chiefs’ Council. Kerry made her silent 999 call in the early hours of December 14, 2013 when her ex-partner and stalker broke into her home. She did not respond to the BT operator’s instructions and her call was transferred to the Silent Solution system, the IOPC said. As 55 was not pressed, the call was terminated and Devon and Cornwall Police were not notified of Kerry’s call. Her ex-partner David Wilder called police later that morning to report he had fatally strangled her. Kerry’s family said: “Happy, fun-loving and considerate are all words you could use to describe Kerry, however the one thing everybody would mention first would be that she was the consummate mum. “After a split from her son’s dad and a tough few years, things were on the up, Kerry was back to her old self and was looking forward. Unfortunately this was all brought to an end by the brutal actions of her ex-partner in December 2013. “After weeks of stalking and inappropriate behaviour, he broke into Kerry’s house with a key he had previously had cut, unable to accept her decision to end their relationship. 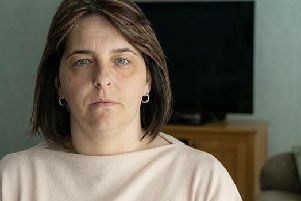 As things escalated Kerry became worried for the safety of herself and her son, who was asleep upstairs and called 999. “Although she was not able to speak for the fear of alerting the intruder to her actions, she followed the advice given by a police officer during an earlier visit; that she could call and not speak, as the police held her details they would be alerted and attend. Our investigation could not conclusively identify the wording the police officer used when advising Kerry about making an emergency call however it was clear she did not know she would need to press 55 when prompted by the Silent Solution system. IOPC Regional Director Catrin Evans said: “It is always best to actually speak to a police call handler if you can, even if by whispering, but if you are putting yourself or someone else in danger by making a sound, there is something you can do. Lisa Johnson, manager of direct services at Women’s Aid, said: “For survivors of domestic abuse calling the police might be too dangerous. Many abusers will threaten to hurt or even kill them if they try to speak out about the abuse. This means that for far too long many women have not been able to access the emergency support they so desperately need from the police. National Police Chiefs’ Council lead for contact management, ACC Alan Todd said: “One of the fundamental roles of police is to help people in an emergency. The police service receives 12 million 999 calls each year, and a small number of callers need to use the ‘Silent Solution’ as they are not able to use their voice during an incident.